In a report on the draft 2012-13 Scottish budget, MSPs from all parties, including the ruling SNP, have forcefully endorsed the outcry from numerous individuals and organisations over the severe proposed cuts to active travel. The cuts come alongside a £100m rise in trunk road spending – a trunk roads increase which is more than 5 times the total of cycling investment. But will SNP Ministers listen? Will they even pay attention to their own 2011 election manifesto? With the budget not finalised until January, make your feelings known now! 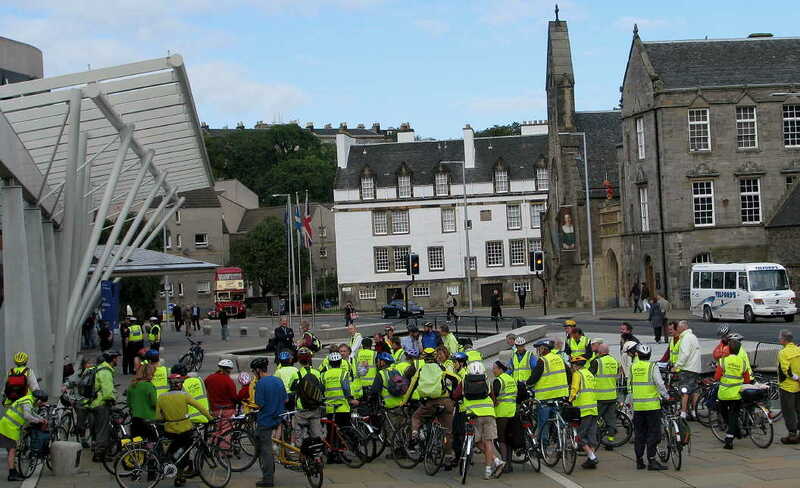 In a remarkable report the all-party Scottish Parliament Infrastructure and Capital Investment Commitee [which has an SNP majority and an SNP chair and vice-chair] has complimented Spokes and called for several of our recommendations to be implemented. But there is no requirement on government ministers to do so. 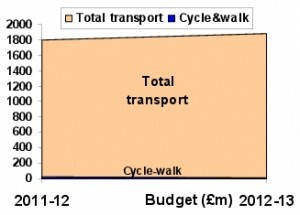 “The Committee notes that the best estimate of levels of funding for active travel is provided by Spokes … and recommends creating a separate budget line for active travel within the transport budget, or even creating respective budget lines for cycling and for walking and safer streets” [para 73]. “The Committee recommends that the Scottish Government should give consideration to setting the active travel budget as a proportion of total transport spending” [para 69]. “The Committee recommends that the Cabinet Secretary seeks to maintain CWSS funding at the current level of £7.5m p.a. and ensures that the fund continues to be ring-fenced” [para 72]. Spokes note – the government has just announced that CWSS (which was £9m in 2010/11, and cut to £7.5m in 2011/12) is to be slashed by a further near 20% to £6.1m in 2012/13. It is rumoured to be cut yet further in 2013/14, before rising again as we approach election year. “The Committee recommends that the (new Future Transport Fund) should be focussed on capital projects that provide high economic return and demonstrably contribute to Scotland’s ability to address the 10% cycling mode share target” [para 67]. “The Committee notes that spending on cycling is highly preventative and contributes to health outcomes as well as congestion and climate change, and that investment in cycling and walking schemes often offers excellent value for money” [para 62]. “The Committee is therefore concerned by the evidence presented by expert witnesses, and by the Cabinet Sec retary’s own confirmation that funding for active travel has been reduced in the draft budget” [para 63]. “The Committee is concerned about the ability of the Draft Budget to deliver on Low Carbon Scotland: Meeting the Emissions Targets 2012-2022 (the RPP document); the Cycling Action Plan for Scotland (CAPS); and the National Performance Framework” [para 57]. Before the holiday there will be a Parliamentary debate on the budget reports from the various subject committees, including the ICI report above. Then in January the government announces the ‘final’ version of its budget, which in theory takes account of the Committee reports. Finally there will be a debate and vote on the budget, probably in late January. With an overall SNP majority, our best hope for improvements is in the period from now up to when the government brings out the ‘final’ budget. 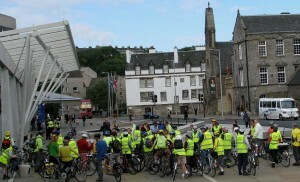 We have heard arguments from a small number of SNP MSPs that the manifesto can still be fulfilled by cutting active travel severely now but bringing in a big boost before the next election, or that the manifesto will still be fulfilled if ‘active travel’ is cut but the government makes up for that by spending more on ‘sustainable travel’ such as low-carbon buses. In strict literal terms they are right, but the average voter would consider such arguments to be the height of cynicism. 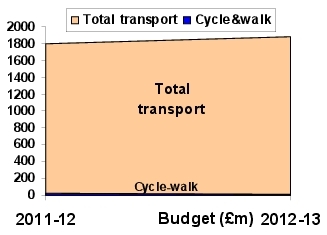 A voter reading the manifesto promise would feel seriously cheated by a government cutting substantially the already small levels of cycling/walking investment in the same year that total transport spending is rising substantially. If you’ve not written to your MSPs, please do so. Find them at www.writetothem.com. If you have written, you might wish to write again, pointing out the findings and recommendations of the ICI Committee. 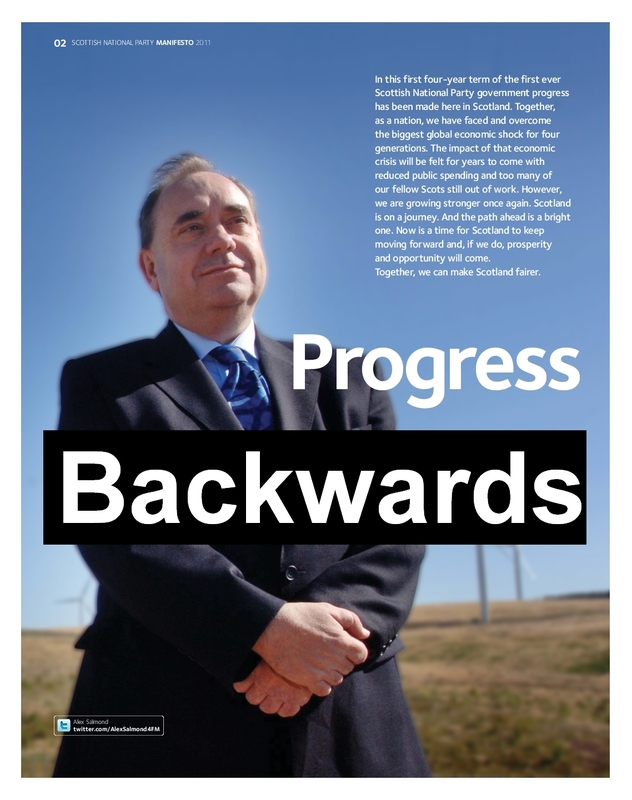 FINALLY … please come to the budget demonstration at 1pm on Jan 11 at St Andrews House [Alex Salmond’s office]. More details to follow, but put the date in your diary now. Organised by national organisations WWF, SCCS, Transform, FOE and others, with Spokes input, let’s make it several times bigger than the Spokes 2008 demonstration – at that time we were merely protesting that cycle budgets were static – but now they are being severely cut.